Netanyahu, Jewish Home leader agree on conditions for inclusion of Otzma Yehudit in Jewish Home-National Union alliance. 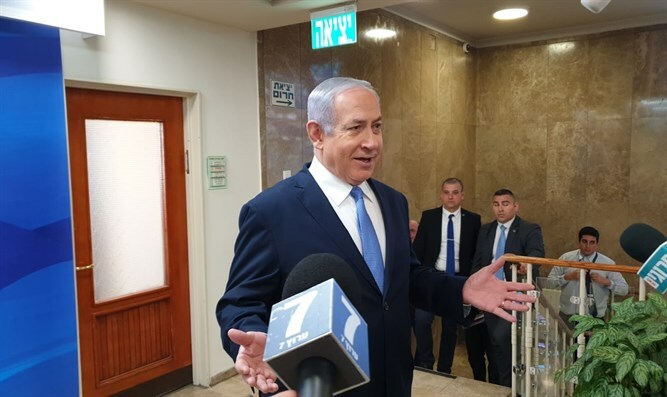 Prime Minister Binyamin Netanyahu met Wednesday with the chairman of the Jewish Home Party, Rabbi Rafi Peretz, and the two agreed on the conditions that would lead to the inclusion of Otzma Yehudit in the joint list of the Jewish Home and the National Union. Jewish Home Chairman Rabbi Rafi Peretz stated that "the preachers of the left cannot be crowned as leaders of the state. At the end of the process everyone will see that we were right. I will make a decision during the day and request the approval of the party's central committee for the agreement." The Jewish Home central committee will convene this evening to vote on the agreement to run on a joint list with Otzma Yehudit. Prime Minister Netanyahu postponed his visit to Moscow to meet with Russian President Vladimir Putin by several days to meet with the leaders of the Jewish Home and National Union to press them to run on a joint list with Otzma Yehudit.